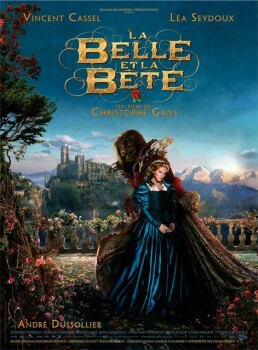 That I am a huge fan of the fairytale Beauty and the Beast, you might already have gathered? It was the very first Disney film that I saw in the theatre and it is still today my favourite Disney film ever. No matter which book that is said to have been inspired by this tale, I must and shall read it. No matter which film or series with just a grain of Beauty and the Beast, I must and shall see it. Unfortunately I’m often disappointed by these so called adaptations, but when I saw the trailer for this French film from 2014 I couldn’t be any more excited than I was. Firstly because it looked like the film would take more from the original storyline than the Disney version. Secondly the visuals, the castle, it looked so beautiful! So I bought the film and one grey day in August I made myself a cozy little nest on the couch to watch this. My expectations were huge due to this trailer and I couldn’t wait. But unfortunately, regrettably, shamefully it was a towering disappointment. The visuals and imagery were not to blame. Those were great. The castle is so beautifully rendered. The landscapes are breathtaking. Belle’s dresses are phenomenal. The beast looks fairly believable, although he may lack mimickry and does not frighten me at all. He’s more like a kitty you want to stroke. But really, in general the effects and scenery are as fairytale-like as one can imagine. Sadly this is also the only thing making this movie special. The makers focussed so hard on the visuals, on endless unnecessary scenes full of visual effects, that they completely forgot to put any feelings into the story. Really, I was so confused. One moment Belle is still screaming if she only thinks the beast is approaching and the next moment she’s deeply in love with him. Okay, we all know that in the fairytale Belle eventually falls for the beast, with eventually being the keyword here. Their romance is not a whirlwind one, not one of love at first sight. Beauty and the beast is all about how the beast redeems himself, forgets his selfishness and learns to love someone else and how Belle begins to see behind his gruesome appearance. But this film forgets all of this and tries to distract us with gorgeous decors and wonderfully decadent dresses. Not an ounce of romance did I spot. Not a whiff of chemistry between the actors. Not a grain of real emotion. So, so, so sad. For a movie based on a story that is all about how the outside is not as important as the inside, this adaptation only gives us outside appearances and zero-point-zero content. I was so mad, so so disappointed. It could have been fantastic. Such a waste.